PHILADELPHIA (AP) — Unmoved by Bernie Sanders' plea for party unity behind Hillary Clinton, several hundred Sanders supporters chanting "Bernie or bust!" took to the streets under the hot sun Tuesday for another round of protests on Day 2 of the Democratic convention. They held a midday rally at City Hall, then made their way down Broad Street to the convention site. By early evening, a crowd of thousands had gathered outside the subway station closest to the Wells Fargo Center as the delegates inside the hall were on the verge of nominating Clinton for president. The crowd consisted of an assortment of protesters espousing a variety of causes, but mostly Sanders supporters and other Clinton foes on the left. Some gathered around a radio to hear what was happening inside the hall, and when Clinton's name was placed in nomination, a chant of "Nominate Sanders!" went up. Earlier in the day, participants at the rally charged that Sanders was cheated out of the nomination by Clinton, and they said they weren't swayed by his Monday night plea to his supporters to fall in line behind Clinton for the good of the country. "He persuaded no one to vote for Hillary," said Greg Gregg, a retired 69-year-old nurse from Salem, Oregon. He said he intends to cast his ballot for Green Party candidate Jill Stein, quoting the turn-of-the-last-century socialist labor leader Eugene Debs as saying, "I'd rather vote for what I want and lose than what I don't want and win." For a brief period Tuesday afternoon, "Bernie or bust" demonstrators who set out for the convention site by subway were forced by police to get off one stop short of their destination. In a crowd-control measure that was also used the night before, only passengers with media or convention credentials were allowed to ride all the way to the Wells Fargo Center. On Monday evening, police cited 54 people for disorderly conduct for trying to climb the barricades outside the convention center during a pro-Sanders protest that reflected the tensions inside the hall between the Vermont senator's supporters and Clinton's. A separate protest, this one against police brutality and racial injustice, took shape in north Philadelphia near the Temple University campus, where about 500 people began marching down Broad Street toward City Hall. The marchers planned to link up with the "Bernie of bust" demonstrators. Protest leader Erica Mines told the crowd it was an "anti-police rally" and a "black and brown resistance march" and instructed all white people to move to the back. The crowd chanted, "Don't vote for Hillary! She's killing black people!" March participant Tiara Willis, 24, of Philadelphia, said she subscribes to the slogan "I'm with her ... I guess," explaining that she supports Sanders' call to back Clinton. She said she won't back Trump and called Clinton "the lesser of two evils." 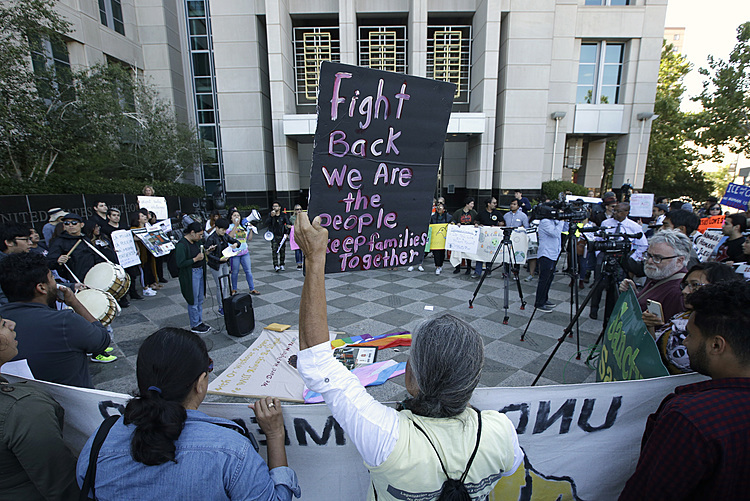 Police estimated 5,500 people took part in Monday's opening-day protests. Many of the marchers chanted, "Hey, hey, ho, ho, the DNC has got to go!" 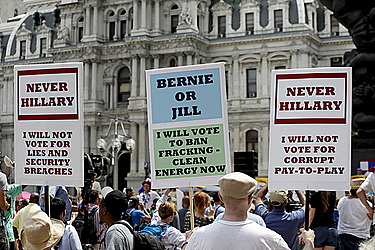 and carried signs reading "Never Hillary," ''Just Go to Jail Hillary" and "You Lost Me at Hillary."